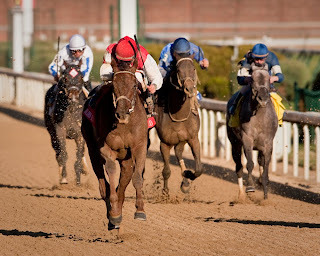 11/28 CD 1st in Ky. Jockey Club (G2). 1/3 AQ 1st in Nashua (G2), 11/28 AQ 1st in Remson (G2). 1/16 SA 1st in San Rafael (G3), 1/25 HW 1st in Allow. 4 AMEN HALLELUJAH Montbrook Rick Dutrow Chantel Sutherland IEAH Stables and Whizway Farms. Winslow Homer Paints a Gray Trail! !